Investment in assets, such as housing. Change in wealth/value of assets in an economy. Technological innovation which increases the productivity of capital. Increase in human capital – e.g. better educated workforce enables an increase in production possibility frontier. Discovering new sources of raw materials, e.g. oil reserves. Capital accumulation often occurs from the profit or dividends from previous investment. 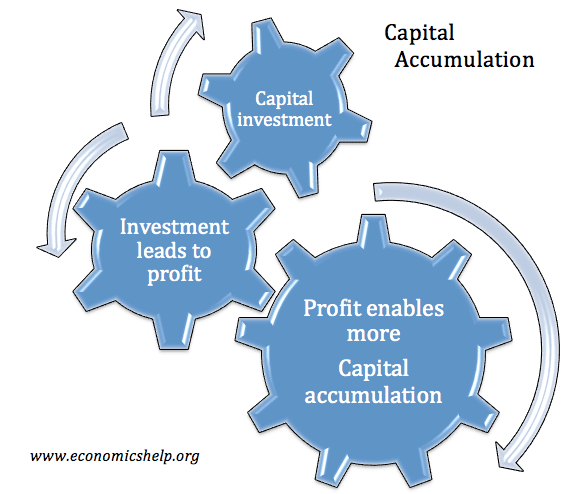 Therefore capital accumulation can become a self-reinforcing cycle – with the wealthy able to increase their capital assets, enabling more profit/rent/dividends to finance further capital accumulation. Capital involves man-made made equipment that is used to make other goods such as machines and factories. Capital accumulation will need to exceed the amount of capital necessary to overcome depreciation. i.e. some capital wears out, so capital investment is necessary to overcome this. Capital accumulation involves additional purchases of capital. The Marxist view of capital accumulation concentrates on how profit from business is reinvested in more capital. This enables capitalist to increase their wealth and dominance of society. However, Marx also believed that capitalism was prone to crisis as there would be times when profit was greater than projects capitalist could invest in. The modern-day economist Thomas Piketty argues that, unchecked, the process of capital accumulation can lead to rising inequality in society. Piketty notes capital doesn’t have to be invested in business but can be invested in other assets, such as housing, shares, bonds. As a general rule, Picketty argues wealth grows faster than economic output. He uses expression r > g (where r is the rate of return to wealth and g is the economic growth rate. This is mainly due to the process of capital accumulation and the fact assets give a rate of return which can be re-invested. Ricardo’s model of economic growth placed a high value on capital accumulation. To Ricardo, capital accumulation came from profit and the willingness and ability of owners to invest in more capital. Growth models based on Solow’s models argue that increasing the capital stock can soon lead to diminishing returns. They argue that economic growth is fundamentally determined by population growth and technological innovation. Endogenous growth models hold that capital accumulation can increase the long run trend rate of economic growth. However, to permit capital accumulation it is necessary to increase the savings ratios. Maintain good banking system and system of loans.